The FEANI-ENAEE Task Force on merging the FEANI INDEX and ENAEE EUR-ACE database into the “European Engineering Education Database” met on 17 August and the IT-company MES from Antwerp, developed the new database by the end of October. Some up-dates by the UK, AT and RU are still ongoing, but the new database will be completed and more reliable than ever before by the end of Q1-2018. 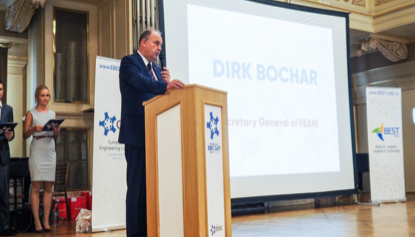 On 27 November the new FEANI-website was launched www.feani.org as announced in our previous Newsletter.From August to December 2017 a series of FEANI-meetings were organized, most of them considering and contributing to the new FEANI Strategic Plan 2018-2023. This applied to the FEANI Northern Regional Meeting in Reykjavik on 23 August, the FEANI National Members’ Forum Meeting on 31 August and the FEANI Central Regional Meeting on 1 September, both held in Hamburg (picture below). Also the EMC considered the new draft Strategy at its meeting in Rome on 14-15 September. For the year 2017, EMC has approved 242 new EUR INGs. An up-dated version of the FEANI Service Agreement with ENAEE – was signed for another two years (till the end of 2019) by FEANI President Prof. J. VIEIRA and his ENAEE counterpart Prof. Bernard REMAUD. 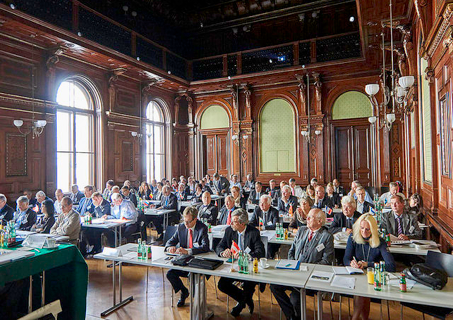 In co-operation with the European Council of Civil Engineers (ECCE) and the European Council of Engineering Chambers (ECEC), FEANI organized the Third European Engineering Day in Vienna on 5 October on the subject “Concerns about Engineering Excellence". About 150 participants from all over Europe participated and discussed very passionately. Speakers from various backgrounds approached the question of securing the availability of engineering excellence in the future from different angles. Mr. Hubert Gambs, responsible Director for the modernization of the Single Market in the European Commission stressed the importance of the quality of engineering services in enhancing economic growth, whereas Mr Maxime Cerutti, Director of Social Affairs at BusinessEurope, put a strong focus on the problem of the shortage of employees in engineering companies and on providing the right engineering skills to better meet companies’ needs. Mr. Philippe de Buck, Former Chief Executive of BusinessEurope and EESC member, questioned if the current policies of the EU are overall adequate to deal with challenges and chances of the changing world and raised the question of how opportunities for engineers could be better exploited. 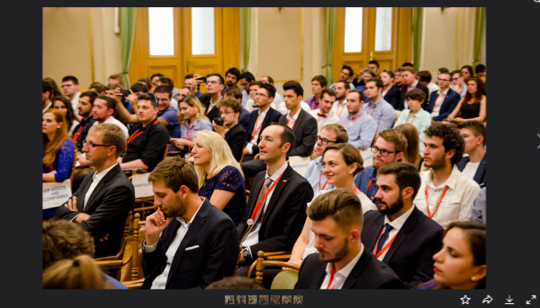 FEANI then held its General Assembly Meeting in the same venue one day later on the kind invitation of its Austrian National Member, ÖIAV/ÖVE. 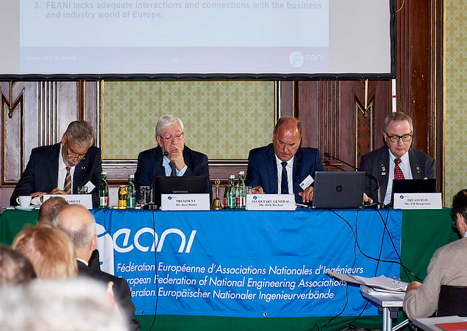 Major topics were the unanimous approval of the FEANI Strategic Plan for the next years and its intended rebranding to Engineers Europe, the reactivation and renewed involvement of National Members from FR, IT and RU and the election of four new Executive Board Members. FEANI welcomed Mr. Paul COUGHLAN (UK), Mrs. Maria NUNO (ES), Mr. Giovanni CARDINALE and Mr. Dusan PETRAS (SK) as new members in the Board, whereas Mr. Trond MARKUSSEN (NO), Mr. Ralph APPEL (DE, Vice President) and Mr. José VIEIRA (PT, President) were confirmed and re-elected for a second three-year term. The implementation of the FEANI Strategic Plan started from the day of its approval. A first common meeting was held with ENAEE and SEFI on 8 December in Brussels to develop and define the Terms of Reference from an “Educational” point of view. Meetings with other stakeholders in the education, business and policy area have been scheduled and are determined in the first weeks of 2018. Various offers from international strategy and communications consultancies are being considered by the FEANI Executive Board and a decison thereto will be taken at its next, forthcoming meeting on 22 January 2018 at the Sheraton Airport Hotel, Brussels. 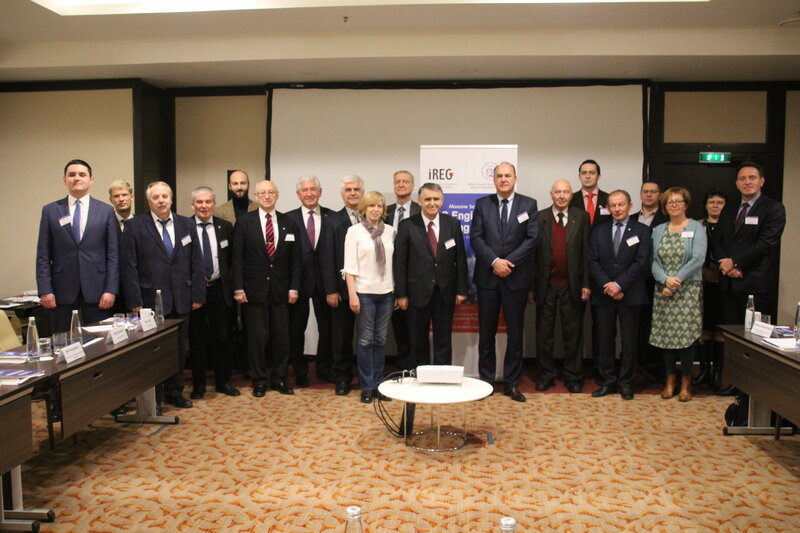 At the beginning of December, FEANI was invited for the second consecutive time to contribute to the IREG Workshop which was this time convened in Moscow : http://ireg-observatory.org/en/ A final report on the International Ranking of Engineering Education is expected to be published in 2018. The next meeting is scheduled on 23 May in Hasselt (BE). While being in Russia for this workshop, the FEANI SG visited the new management of RUSEA, the Russian FEANI National Member. The Organization is eager to contribute to the work of FEANI and to have the Russian engineering programmes registred in the European Engineering Education Database as soon as possible. New Secretary General is Mr. Sergey DRUKARENKO, Director for International Affairs is Mr. Kirill KOROVITSIN and as member in the EMC, Prof. Nikolay P. KALASHNIKOV has been proposed (to be confirmed). 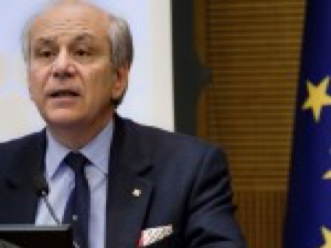 The FEANI President participated at the same time in Rome at the WFEO General Assembly on the kind invitation of CNI and its President Armando ZAMBRANO. 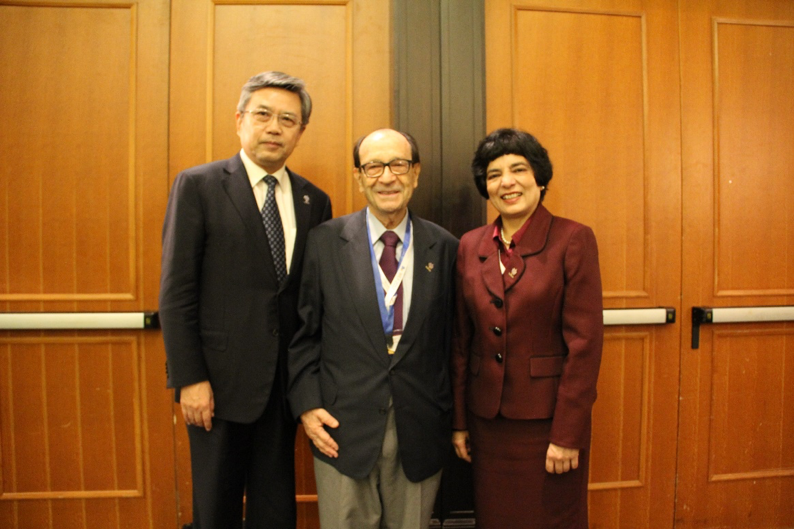 Mr Ke GONG from China was elected as WFEO President Elect, here with Mr Jorge SPITALNIK (Past WFEO President) and Marlene KANGA (WFEO President). 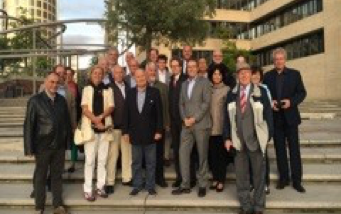 Other FEANI representatives present in Rome were Prof. Dr. Daniel HANUS and Prof. Dr. Dusan PETRAS. Finally, on 13-14 December and 21-22 December respectively, Mr Karel de WEVER (MES) and EMC Secretary Ms. Rita HEISSNER visited our Turkish National Member (TMMOB) in Ankara to provide FEANI and IT-training on setting up an NMC, procedural issues on the database, etc. Mr Lars FUNK contributed a week later to the TMMOB Conference with an opening speech on behalf of FEANI. The Bulgarian presidency efforts will focus on shaping up a stable European Energy Union and making progress on the priorities of the Council of the EU, including the legislative and non-legislative proposals of the ‘Clean energy for all Europeans’ package. The Bulgarian presidency will also strive to improve the interconnectivity in the Western Balkans and the cooperation among the respective Balkan states in view of ensuring the security of energy supplies in the Region. The Bulgarian presidency will do its utmost in making progress on the ‘Clean energy for all Europeans’ package proposals through balancing out the member-states interests and working out widely acceptable compromise solutions. The integrated EU energy market is undoubtedly contingent upon a better cooperation. Energy efficiency is a key element of the Energy Union and plays a primary role in achieving a low-carbon economy. 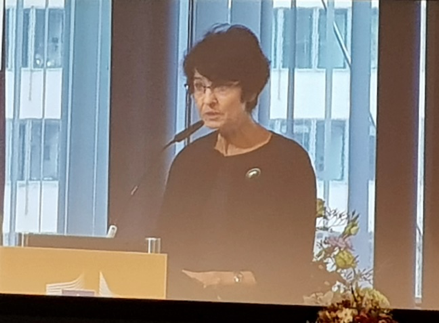 Based on the Estonian presidency’s results, Bulgaria will work towards making progress in the negotiations with the European Parliament on the energy efficiency legislative proposal. The Bulgarian presidency finds it opportune to continue seeking balance between security and reliability of the reporting system and providing flexibility in meeting the national targets of the member-states within the governance of the Energy Union. Considering the interdependence of the Governance of the Energy Union regulation and the energy efficiency and renewable energy directives, Bulgaria will support working on these files in parallel and in line with the already adopted approach. With respect to the proposed electricity market design, it is considered that integrating an increasing share of RES will result in a radical restructuring of the energy system of the member-states and their energy mix. Now that a general approach on the proposal for risk-preparedness in the electricity sector is a fact, upon coming to a general approach on the proposal for promoting the use of energy from renewable sources as well as on the 3 remaining files of the market design sub-package, the efforts will be focused on taking actions in initiating trilogues and subsequently achieving a maximum possible progress in the negotiations with the European Parliament. Bulgaria will strive to develop the potential for regional cooperation through putting in place the missing infrastructure in order to ensure the security of energy supplies. In this respect, operational gas interconnectors with the neighbouring countries as well as an European gas hub in the Balkans are of paramount importance in ensuring the energy security in South-East Europe. More than 20 conferences and expert meetings on energy topics are scheduled during the Bulgarian presidency of the Council of the EU. Regular Council meetings are planned to be held in February, in Brussels (if needed), and in June, in Luxembourg, one informal meeting of the energy ministers in April 2018, in Sofia, an investors’ round table on the Balkan gas hub, an annual meeting of the High-level group for interconnectivity in Central and South-Eastern Europe (CESEC), etc. According to a 2015 study by the European Parliament, the EU could face a shortage of skills in science, technology, engineering and maths (STEM), at a time when seven million jobs linked to these disciplines are to be created by 2025. There are already shortages of qualified persons in certain areas, in particular IT. There are two reasons for this: shortages of European pupils studying STEM subjects at secondary level, while the proportion of 'low achievers' has increased since 2012, according to the 2015 PISA study, and dwindling numbers of people studying STEM subjects in higher education. While the overall number of STEM students went up by 37% between 2003 and 2013, the proportion of people studying these subjects as opposed to other subjects did not. 1. How does the Commission account for the results of the 2015 PISA study? 2. In its report 'Addressing low achievements in technologies and science (2010-2013)', the Commission noted that migrant children performed poorly in STEM subjects. In the Commission's view, what impact will the growing number of migrants being taken in have on the 2020 target to reduce the proportion of 'low achievers' to just 15%? Answer given by Commissioner Mr Navracsics on behalf of the Commission : the Commission takes action to encourage, support and complement Member States' activities in the field of education, while respecting their overall responsibility for educational policy. The Commission published an analysis of the 2015 PISA in December 2016. The report shows that the performance of students with a migrant background in education and training is strongly correlated with their socio-economic status. Since many migrant students come from a lower socioeconomic background, the differences in performance are smaller in almost all Member States when adjusting for socio-economic status. The variety in performance across Member States also indicates that the specific policies to integrate students with migrant background in education and training impact strongly on their performance. Recent Commission Communications on Modernising Higher Education and school development and excellent teaching propose targeted action to improve STEM (science, technology, engineering, maths) education and motivate young people to pursue careers in these areas. They also address the need to better support the integration of students with migrant background in education and training. The approach of the New Skills Agenda, which was launched in June 2016, has been to boost the development of a very broad set of skills combining transversal skills with more specific skills needed by the labour market and the economy in subjects such as mathematics and science. Through the Erasmus+ programme the European Union provides funding for school projects improving the achievement levels in maths and science. The European Union does not require diplomas awarded by one Member State to be recognised as equivalent to those issued by another Member State. The Member States alone are responsible for the content and structure of their education systems. However, recognition is generally provided for by exchange agreements and through the use of ECTS (European Credit Transfer and Accumulation System). Is the Commission considering putting in place an electronic platform ensuring equivalence and recognition of diplomas issued in the Member States? Answer given by Mr Navracsics on behalf of the Commission : The Communication "Strengthening European Identity through Education and Culture" (COM(2017) 673 final) of 14 November 2017 calls for the development of a "Sorbonne process", which would be underpinned by a Council Recommendation on the mutual recognition of higher education and school leaving diplomas. Such a process would facilitate mutual recognition and take further the currently existing systems of cross-border validation of training and lifelong learning certificates. To support this initiative on mutual recognition, the Commission has proposed the development of a secure electronic system for the storage and retrieval of academic diplomas to facilitate verification of authenticity. Please follow the link to access the EP IMCO report on the proposal for a directive of the European Parliament and of the Council on a proportionality test before adoption of new regulation of professions. Education is essential in preparing young people for the world of work; in helping them to be the innovators of tomorrow; in making them feel a part of their society; and in creating democratically active and engaged citizens. The modernisation of our education systems is a pressing need, and one that must address structural challenges irrespective of their difficulties. What are these difficulties? First, too many young people do not achieve a sufficient level of basic competences. The latest results of the OECD PISA survey show that one in five pupils have serious difficulties in developing a minimum level in reading, mathematics and science skills. What is even more worrying – as the latest edition of our Education Monitor, published just recently, confirms – is that pupils from a lower socio-economic background are almost five times more likely not to reach the basic level of competence in science, for instance, than those from a higher socio-economic background. We cannot allow this to continue. Second, our societies are becoming increasingly mobile and digital. Already today, 90% of all jobs require at least some level of digital skills. Yet, there is a digital skills shortage that we must overcome. Most importantly, the vast majority of European do not properly master new technologies, preventing them from becoming informed citizens in the digital age. Paradoxically, this is very much the case of the younger generations, the so-called digital natives who might be digitally confident, but not always digitally competent. Schools working in partnership with other learning providers are part of the solution in addressing this challenge. They can offer students the opportunity to learn about science, technology, engineering and maths, the so-called STEM subjects and motivate them to work in this fascinating and growing sector. Third, given the ongoing digital revolution in the workplace and our societies, lifelong learning must become more widespread throughout the EU. Lifelong learning, for all Europeans, will play a vital part in ensuring no one is left behind and unable to find a job. Yet, there is much to be done in this particular field – because today, adult learning remains the exception, not the rule. Fourth, more must be done to foster an entrepreneurial spirit amongst young Europeans, so that they learn all the necessary soft skills to adapt and make the most of the new realities of the labour market and stand on their own feet. Partnerships between schools and businesses, at all levels, are fundamental if we are to achieve this aim. Entrepreneurship is not just a specific skill, it is a broad set of competences that give a person the confidence and the know-how to embark on an entrepreneurial career, or indeed to use the entrepreneurial mind-set in any job or other aspect of their lives. Yet, what use are all of these skills and knowledge if they are not grounded in our common and shared values? It is imperative that young Europeans are taught in a context that promotes our values. If our students can develop these values, they will become more resilient to the lies, rhetoric and divisive views espoused by the undemocratic and radical forces present in today's Europe. Honourable members, how can we overcome these challenges, how do we steer the agenda at European level? The education package launched on 30 May signalled the importance that this Commission attaches to the modernisation of education. It announced concrete actions in support of Member States' reforms in the fields of school and higher education. I am pleased that this Committee, and rapporteur, Ms Šojdrová, are taking a keen interest in our proposals. Over the past weeks, European cooperation in education has gained further momentum and has been put high on the political agenda. Only two weeks ago, we saw EU Heads of State and Government discuss the Communication on Strengthening European Identity through Education and Culture, adopted by the Commission on 14 November. A Europe where skilled and resilient citizens contribute to jobs, growth and innovation and where jobs, growth and innovation are instrumental to the well-being of citizens. A Europe where people feel empowered to help shape our communities and share a strong sense of European identity in all its diversity. A Europe where our performance in basic skills is drastically improved, where Europeans speak more than one language, where mobility is a reality for more people, especially in schools, where quality early child education is an antidote to inequalities, where we set ambitious benchmarks on entrepreneurship education and lifelong learning. And finally, a Europe that invests smartly in education and sees it as an investment, not as an expenditure. Item 2 : With the debate on the future of Europe in full swing, the European Commission on 14 November set out its vision for how we can create a European Education Area by 2025. The ideas formulated were intended as a contribution to the EU Leaders' meeting on 17 November 2017 in Gothenburg, where they discussed the future of education and culture. The Commission believes that it is in the shared interest of all Member States to harness the full potential of education and culture as drivers for job creation, economic growth and social fairness as well as a means to experience European identity in all its diversity. Vice-President for Jobs, Growth, Investment and Competitiveness, Jyrki Katainen said: "A collective effort would enable Europe as a whole to shape its future, deal better with the challenges it is facing and to become more resilient. One of Europe's greatest achievements was to build bridges across our continent with the creation of an area of free movement for workers and citizens. But there are still obstacles to mobility in the area of education. By 2025 we should live in a Europe in which learning, studying and doing research is not hampered by borders but where spending time in another Member State to study, learn or work is the norm." Commissioner for Education, Culture, Youth and Sport, Tibor Navracsics, said: "As we look to Europe's future, we need to equip ourselves with an ambitious, shared agenda for how we can use culture and learning as a driver for unity. Education is key, because it is education that equips us with the skills we need to become active members of our increasingly complex societies. It is education that helps us adapt to a rapidly changing world, to develop a European identity, to understand other cultures and to gain the new skills one needs in a society that is mobile, multicultural and increasingly digital." Meeting in Rome in March 2017, Europe's leaders committed to creating a "Union where young people receive the best education and training and can study and find jobs across the continent." The Commission believes that education and culture can be an important part of the solution in tackling the challenges of an ageing workforce, continued digitalisation, future needs for skills, the need to promote critical thinking and media literacy in an era where "alternative facts" and disinformation can proliferate online, as well as the need to foster a greater sense of belonging in face of populism and xenophobia. Investing in education: by using the European Semester to support structural reforms to improve education policy, using EU funding and EU investment instruments to fund education and setting a benchmark for Member States to invest 5% of GDP in education. Preserving cultural heritage and fostering a sense of a European identity and culture: by developing – using the momentum of the 2018 European Year of Cultural Heritage – a European Agenda for Culture and preparing a Council Recommendation on common values, inclusive education and the European dimension of teaching. Strengthening the European dimension of Euronews, which was created in 1993 by a number of European public broadcasters, with the ambition of having a European channel offering access to independent, high quality information with a pan-European perspective. Item 3 : European Vocational Skills Week : 20-24 November 2017 - Apprenticeships may not yet be universally "cool", but their star is certainly on the rise, writes Stephan Howeg. Stephan Howeg is Chief Marketing Officer and Communications of the Adecco Group. What would you say about an engineering apprentice ending up as an executive board member of a global Fortune 500 company? Or what about the thousands of contented former apprentices running, and often owning, the small and medium sized businesses that are the backbone of many economies? (...) Please click here to access the full article. 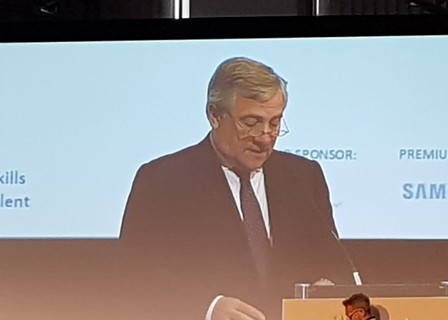 During those days of the Vocational Skills Week the opening speeches were delivered by the President of the EU Parliament, Mr Antonio TAJANI and the EU Commissioner for Employment and Social Affairs, Mrs Marianne THYSSEN: they presented the “European Pact for Youth”, equipping youth for the future of work and making Business-Education Partnerships the New Norm in Europe. The Pact, initiated by The European Business Network for Corporate Social Responsibility (CSR Europe), is an appeal to all business, social partners, education and training providers, as well as other stakeholders, to develop or consolidate partnerships in support of youth employability and inclusion. More information can be retrieved from : https://www.csreurope.org/pactforyouth . 9 January: Public hearing by the European Economic and Social Committee (EESC), entitled “Cybersecurity challenges and supporting a thriving cybersecurity industry in the EU”. 12 January: The European Commission is organizing a conference entitled “Data sharing companies in Europe – results from the EC study on B2B data sharing in Europe”. 23 January: the 10th International Cybersecurity Forum is taking place over two days in Lille, France.